(adj) to go (as opposed to sur place, for here). old-fashioned, as in une baguette à l’ancienne. (f) in a bird (mostly duck or chicken), the tip of the breast meat. (m) potatoes mashed with fresh mountain cheese; a specialty from Auvergne. (m) or amuse-gueule. Savory nibbles served before the meal, to arouse the appetite. (f) Appellation d’Origine Contrôlée. A certification granted to certain food items (such as varieties of cheese or produce) made in a specific area, according to a specific production process. (m) or apéro. A pre-dinner drink. Also: a general term for the drinks and savory nibbles served before dinner. It is also a widespread custom to invite people over just for l’apéro, which is a more casual way to entertain than a full-blown dinner invitation. (m) a spongy yeast cake soaked with rum syrup, often served with whipped cream. (m) bar, or sea bass. (m) firm cow cheese from the area of Beaufort, in the French Alps. (f) mezza-luna; a chopping tool with two handles and two half-moon blades. Literally: lullaby, because of the rocking movement made while using it. (m) butter. Beurre doux is unsalted, beurre salé is salted. (adj) (short for biologique) organic. (m) a pink, rectangular ladyfinger and a specialty from Reims, it was designed for dipping in a glass of Champagne. It keeps its shape when moistened, which makes it perfect for charlottes. (m) a set pudding made with almond milk. (f) a creamy stew, generally of veal, cooked with carrots, onions, and mushrooms. (f. pl.) also: bettes. Swiss chard. (adj) very rare. Literally: blue. (m) a stew of beef, red wine, and vegetables; a specialty from Burgundy. (m) spicy blood sausage. A twist on boudin noir and a specialty from the Antilles, the French Carribeans. (m) a soft white sausage. (f) salt cod mashed with olive oil and milk until smooth; sometimes made with potatoes, too; a specialty from Provence. (f) originally, a restaurant that served beer (the literal meaning of brasserie is brewery) and a simple hearty fare, often of Alsatian inspiration. The term is now used, more broadly, for traditional restaurants that are larger than bistros and offer a longer menu served around the clock (choucroute, grilled meat, shellfish platters, etc.). (f) (alternate spelling: brik) a very thin wheat dough used in North African cuisine, similar to phyllo dough but slightly thicker and grainier. (f) a lightly sweet yeast pastry, made with eggs and butter. (f) a type of fresh cheese from Provence. It is called brocciu when made in Corsica. (m) espresso with added water. (m) a cake baked in a loaf pan. (m) an almond shaped confection from Aix-en-Provence, made with almond paste, sugar, and crystallized melons, with wafer paper at the bottom and a crisp sugar glaze on top. (m) (alternate spelling: cannelé) a small cake from the city of Bordeaux, caramelized and crusty on the outside, soft and chewy on the inside. (f) school or office cafeteria, it is sometimes used to mean a restaurant that has a laid-back and relaxed atmosphere, and where you could see yourself having lunch or dinner everyday. (f) a stew of beef, beer, and onions; a specialty from the French Flanders and Belgium. (m) curry (in créole cuisine). (m) rack (as in a rack of lamb). Literally: square. (f) a soft brown cane sugar. (m) a stew from the South-West of France, involving white kidney beans and various meats cooked in goose fat. (f) fromage blanc flavored with herbs and garlic; a specialty from Lyon. Literally: silkweaver’?s brain (silkweaving was the traditional craft of Lyon). (m) blowtorch; can be used to caramelize the sugar topping on crèmes brûlées. (f) a store halfway between a butcher’s shop and a deli. Also, the variety of sausages and pork products (jambon, saucisson, salami, mortadelle, pâté…) sold in such stores. (f) a no-bake dessert in which the mold is lined with ladyfingers, then filled with layers of fruit, and layers of custard or fromage blanc. (f) a variety of small potatoes, tender-fleshed and sweet. (m) short for fromage de chèvre, goat cheese. (m) an elongated donut similar to the Spanish churro, usually sold by beach-side vendors, rolled in sugar and served in a paper wrapping. Sometimes called chouchou. (m) the best edible thing on Earth. (m) an artisan who makes and sells chocolate confections. (f) like a teapot, but for hot chocolate. (f) sauerkraut served with assorted sausages and cured meats. (m) a golf-ball-sized pastry puff sprinkled with pearl sugar. (m) a simple, grandmotherly dessert in which a pudding batter (usually made of flour, sugar, milk and eggs, sometimes butter) is poured over fruit (most commonly cherries, to make clafoutis aux cerises) and baked. A specialty from the Limousin region. (f) a coconut shaped exactly like a pair of buttocks that’s unique to the Seychelles and is said to have aphrodisiacal virtues. (f) a heavy (most often cast-iron) pot with a lid. (m) mallard. Literally: green neck. (adj) full (for a restaurant), or whole (for a grain). (f) a dessert made of fruits cooked slowly with sugar or syrup. Also used, by extension, for vegetables or meat cooked the same way. (m) semi-firm cow cheese from the Jura, a mountain range in the East of France. (m) applies to any preparation that’s cooked in its own fat, or cooked slowly until very soft. (m) a duck leg, salted and cooked slowly, then packed in its own fat. A typical dish from the South-West of France. (f) milk jam. It is the French equivalent of dulce de leche, i.e. a creamy caramel spread made with evaporated milk and sugar. (f) in the shell. Oeuf à la coque is a soft-boiled egg served in the shell. (f) a custard-like dessert served in a round and shallow earthenware ramekin, and sprinkled with a layer of sugar that’s blowtorched into a caramel crust just before serving. Literally: burnt cream. (f) blackcurrant liqueur, typically blended with white wine to make a kir cocktail. (f) also: crème liquide. Whipping cream. (f) thick, slightly sour cream, that doesn’t curdle when heated (it’s the fat content, you see…). Substitute heavy cream or sour cream, preferably a mix of the two. (f) large and thin pancake. A specialty from Brittany. (f) restaurant that specializes in crêpes and galettes. (m) a crunchy almond cookie from Provence. (f) a style of eating raw vegetables, with salt as the only seasoning. Used for radishes especially (radis à la croque au sel). (m) a croque-monsieur with a fried egg on top. (m) a grilled sandwich of cheese and ham, sometimes topped with a béchamel sauce. (f) (Alternate spelling: cuiller) spoon. (prefix) half- (as in demi-baguette). (m) after-dinner drink, usually a brandy such as Armagnac or Cognac. (f) hardware store. Despite the name, does not sell drugs, legal or otherwise. (v) to split dishes. Short for moitié moitié, which means “half half”. (adj) stuffed, as in “stuffed zucchini”, not “I’m stuffed” (that would be j’ai assez mangé, I’ve had enough, or j’ai trop mangé, I’ve eaten too much). (f) corn starch. Also referred to by the brand name Maïzena. (f) a farm-inn, i.e. a farm that also operates as a casual restaurant, in which the farm’s products are cooked and served. (f) a sheet of plastic that chocolatiers use to ensure their confections have a shiny finish. Literally: guitar sheet. (m) a small almond cake shaped like a gold ingot. (f) flecks of sea salt collected at the surface of salt marshes. Grey-white and slightly moist, it has a distinctive and delicate taste. (m) small disks of slivered almonds and candied fruits, baked together in sugar, honey, butter and/or cream, and dipped in chocolate. Recipe here. (m) a selection of the best items in a category. (m) the liver from a fatted duck or goose. (f) a type of fondue in which you cook cubes of meat (generally beef) in hot oil then eat them with a variety of dipping sauces. (f) cheese fondue, made with white wine and cheeses from Savoie, a region on the French side of the Alps. (f) a limited selection of dishes offered for a set price, usually cheaper than a menu. (m) blue cheese from Auvergne, a mountain range in the center of France. (f) something fried. Specifically: tiny fried fish served in the South of France, and the fish-shaped Easter chocolates meant to represent them. (m) a smooth, unsalted fresh cheese, similar to yogurt. (m. pl.) literally: fruits in disguise. A traditional Christmas confection, in which dried fruits (dates and prunes mostly) have their pit replaced with a piece of brightly colored marzipan. (m. pl.) dried fruits. Nuts are sometimes included in that category. (f) a savory crêpe made with buckwheat flour. Also: any preparation that’s flat and circular, or patty-shaped. (f) a puff pastry pie filled with frangipane, which is a mix of almond cream and pastry cream. It is one of the traditional cakes served on the Epiphany, a Christian holiday celebrated on January 6. (f) a smooth preparation of chocolate melted with cream and/or butter. It is used in filled chocolates and chocolate tarts in particular. (f) ice, or ice cream. (m) afternoon snack kids are given when they come out of school around 4pm, hence the other word for it, le quatre-heure. (m) pencil-shaped breadstick cracker, similar to the Italian grissino. (m) firm cow cheese from the town of Gruyères, in the Swiss Alps. (m) bean. Haricot vert = green bean, haricot blanc = white bean, haricot rouge = red bean. (m) snow pea. Literally: the eat-everything bean (unlike regular peas, you eat the pod as well). (m) white kidney-shaped bean from Tarbes in the Pyrénées. It is the only bean to be protected by a Label Rouge and regional appellation, and can only be hand-picked. (f) red chili garlic paste from North Africa. (f) egg whites beaten until stiff then poached or baked, and served in a cup of crème anglaise. Literally: floating island. (m) fermented milk from Brittany (laez ribod in Breton), a cousin to the North African kefir. (m) a small strip of bacon. (m) a cookie made with ground almonds and egg whites. The macaron parisien in particular is made of two delicate meringue-like cookies sandwiched together by a creamy filling. (f) lamb’s lettuce, i.e. a salad green that comes in small bouquets of mild-flavored leaves shaped like drops (or lambs’ ears). (f) a small, butter-rich teacake baked in an oval mold that gives it a vaguely scallop-like shape. The dough rises in the oven to form a characteristic bump which is, to some, the tastiest part of the madeleine. (m) the breast of a fattened duck or goose. (m) candied/glazed chestnut, i.e. a chestnut that is cooked in several baths of sugar syrup until meltingly tender. A typical Christmas delicacy. (m) a disk of chocolate topped with dried fruit and nuts. Also: any preparation (cake, ice cream, chocolate tart…) that involves chocolate, dried fruits, and nuts. (f) the crumb of a loaf of bread. Not to be confused with miettes, crumbs. (m) A napoleon, i.e. a rectangular pastry made of alternating layers of puff pastry and vanilla pastry cream, iced with white fondant or sprinkled with confectioner’s sugar. Also: any dish involving layered ingredients. Literally: one thousand sheets. (f) a bright orange cheese from the North of France. It is labeled extra-vieille (“extra-old”) when aged for a long time until brittle and very sharp. (adj) soft, mellow. When referring to wine: sweet. (m) a soft cow cheese from the Jura with a thicker rind wrapped in pine bark and sold in a round wooden box. A popular way to serve it is the boîte chaude (hot box), in which the Mont d’Or is oven-baked in its box, with a splash of white wine, and eaten warm. (f) fresh or salt cod. (f) a finger of toasted bread, usually spread with butter, to be dipped into a soft-boiled egg. (m) turnip. Also: a bad movie. (f) a crunchy mixture of caramel and chopped almonds, often used in pastries as a layer or as a decoration. (m) an egg baked in a ramekin over other ingredients — usually ham and crème fraîche, with an optional topping of grated cheese. (f) a chocolate confection in which a strip of candied orange rind is dipped in dark chocolate, sometimes with chunks of almonds. Recipe here. (m) a honey spice cake, litterally “spice bread”. (m) rustic bread. Literally: country bread. (m) French toast, i.e. slices of day-old bread or brioche dipped in an egg batter and sautéed in butter until golden. (m) rustic starter bread, sold by the Poilâne bakery. (m) a soft, flat round of bread with dimples from Sweden. (m) a fried chickpea flour patty. It is a specialty from Marseilles, typically sold by beach-side vendors. (f) a technique in which ingredients (fish, most often) are wrapped in foil or parchment paper and baked in the oven. (m) a mixture of finely chopped or pureed seasoned meat, usually used as a spread on bread. (f) a flaky pastry dough made with flour, butter, eggs, and, if it is to be used for a sweet preparation, sugar. (f) almond paste, or marzipan. (f) sweet and crumbly pastry dough. (f) pastry. Also: pastry shop. (m) a rectangular piece of meat or fish. Literally: paving stone. (m) a crisp, rectangular butter cookie. (m) fresh unsalted cheese sold in small cylindrical cartons. (f) stewed bell peppers, tomatoes, and onions combined with scrambled eggs; a specialty from the French Basque country. (f) an onion tart with black olives and anchovies, on a thin bread-like crust. A specialty from Nice, in the South of France. The name comes from pissalat, a condiment made with pureed anchovies, cloves, thyme and bay leaves, which was traditionally spread on the tart before baking. (m) a paste made of basil, olive oil, garlic, and sometimes cheese, equivalent to the Italian pesto. A specialty from Provence. (m) dish, or main dish. (f) any preparation cooked in a skillet. (f) breast, or, for pork, belly. (f) apple. Sometimes also used to mean potato, short for pomme de terre, as in pommes sarladaises, pommes sautées, pommes frites, pommes dauphines, etc. (f) potato. Literally: earth apple. (f. pl.) potatoes sautéed with garlic (and sometimes mushrooms) in duck fat. A specialty from Sarlat, in the Périgord region. (m) a stew of beef with carrots, onions, turnips, and leeks. (m) winter squash with a delicate chestnut flavor. Its French name is a portmanteau of potiron (pumpkin) and marron (chestnut). (m) (also: pountari) a terrine of pork, swiss chard, and prunes; a specialty from Auvergne. 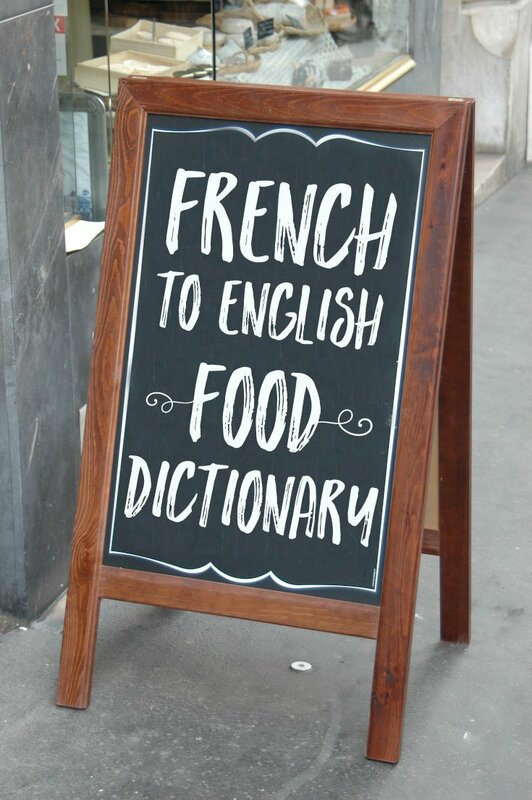 Note: in France, menu prices include a 15% service charge. (f) sprout, or young leaf. (f) a paste made of ground caramelized nuts and chocolate. (f) a chocolate bite filled with the above paste. (f) a caramelized nut, usually an almond or a peanut. (f) a sugar-coated almond with a pink coloring; a specialty from Lyon. (m) an intermediary course served after the main or cheese course, to cleanse the palate and prepare it for the dessert. (f) mashed potatoes, or any mashed preparation. (f) an oval dumpling, classically flavored with pike, served poached or baked. Also used to designate the shape of such a dumpling. (f) an oval plum with purple skin and green flesh. It is similar to the damson plum, but sweeter. (adj) refined. Non raffiné means unrefined — whole (for flour) or raw (for sugar). (f) a vegetable stew made with tomatoes, zucchini, eggplant, peppers, onions, herbs and olive oil; a specialty from Provence. (f) a small, nutty potato, similar to the fingerling potato. (f) a round, green-skinned plum. Literally: Queen Claude. (m) a moist towelette with a citrus smell on which to wipe one’s fingers after eating seafood. Also: a small bowl filled with citrus water, serving the same purpose. (pl, m) sweetbreads, of veal or lamb. (m) an individual round goat cheese, produced around the town of Rocamadour, in the Périgord region. (m) coconut macaroon. Literally: coconut rock/boulder. (f) rucola or arugula, a peppery and tangy spear-leaved salad green. (adj) rare, when referring to the cooking stage for duck or lamb. (m) a potato pancake with cheese. (m) goatfish, or red mullet. (m) a sweet, whipped sauce flavored with wine. (m) a butter cookie with a sandy consistency. (m) pig’s head sausage from Lyon. (m) a member of the wait staff of a restaurant who specializes in wine. (m) crunchy cinnamon and cassonade cookie from Belgium. (adj) for here (as opposed to à emporter, to go). (f) green or black olive paste. (m) a dish that involves a raw ingredient, chopped or diced finely, and seasoned. The most classic example is steak tartare, made with raw beef, but the term is also used for preparations of raw fish or vegetables. (f) a thin Alsatian tart usually garnished with crème fraîche, onions, and lardons. (f) fruit pie (traditionally made with apples) baked with the crust atop the fruit, but flipped before serving. (f) originally, a slice of bread, toasted or not, with something spread on it, usually eaten for breakfast. More recently, a main dish of one or two slices of bread on which ingredients are laid, creating a sort of open-faced sandwich. (m) a preparation of meat, fish or vegetables, cooked or assembled in an earthenware dish and served cold, in slices. Also: the earthenware dish used for such preparations. (f) a wheel-shaped Swiss cheese. It is traditionally served in thin shavings, cut from the top of the cheese with a rotating knife planted in the center of the wheel. Literally: monk’s head. (adj) lukewarm, or slightly warm. (f) tumbler, can be used for any dish served in a small cup, or shaped like a small cup. (f) a savory pie with a top crust. Also: a loaf of rustic bread. (m) a cheese cake from the Poitou region, traditionally made with fresh goat cheese. (m) an ice cream and meringue cake. (m) another name for Mont d’Or cheese. (adj) steamed (it then stands for cuit à la vapeur). (m) a smooth and velvety soup. (f) a soft brown (or light brown) sugar made from sugar beets, and a specialty from Belgium. (f) a ball jar used in canning. (f) any dish served in a jar or glass. (m) a type of shellfish with a soft and deeply wrinkled shell that looks like a rock covered with seaweed, and bright yellow flesh. Also called biju or patate de mer.